As much as pitting your skills against those of other gamers is a great way to spend your time, it's not always the most relaxing or invigorating. If you lose a bunch of games, feel like the game cheated you out of a victory, or just find the idea of competing a little stressful, cooperative games can be a much nicer way to spend you time. We're big fans of COOP gaming here at Megagames and to show our appreciation for some of our favorite games out there, we've put together a list of what we consider to be the best coop games on PC at this time. It's not exhaustive and there are many others we enjoy too, but these are some of our favorites. Tell us your favorite COOP games in the comment section below. Divinity: Original Sin and its sequel are both fantastic looking games that blend real time exploration, character interaction, and development with turn-based combat into a deep, strategic experience which lets you role play and min-max to your heart's content. Better yet, you can do it with friends too, with players taking on the roles of one or more of the party of four characters. You'll need a mod to play with more than one friend in the first one, but both games offer some of the most fun you can have in COOP dungeon crawling. It might be a little long in the tooth, but The Behemoth's second game, Castle Crashers still offers a fantastic arcade hack and slash experience with the company's classic tongue in cheek humor and art style. You'll take on the role of one of four unique heroes as you fight your way through levels and epic boss battles. There are tonnes of collectibles and upgrades to find and unlock making the game very replayable. It's super silly and very janky, but that's half the fun. 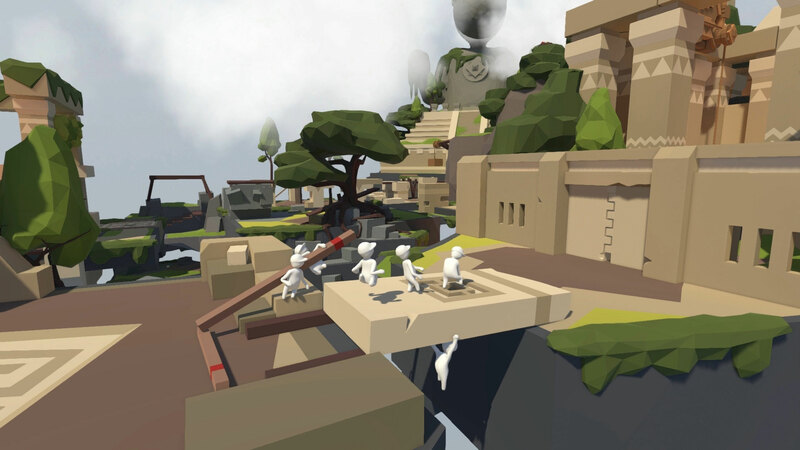 A little like Gang Beasts in style but not in execution, Human Fall Flat sees you and your friends working together to traverse expansive levels, solving puzzles along the way. You'll need to fight the controls as much as the traps and challenges of the world, but it's a fun and silly game that lends itself to drinking games and light hearted banter throughout. Although not strictly a cooperative game by itself, Tabletop Simulator opens up your digital tabletop to any board game you can think of. Although there are a number of official DLC packs, the Steam Workshop has a much wider selection and many of those games are cooperative. It's far better than most tabletop conversions because it does a better job of emulating the experience (though some scripted games do speed up certain titles – we're looking at you Kingdom Death) of actually moving your pieces around and playing cards. A game beloved for its ability to be played by expert and entry-level games alike, Overcooked is a silly arcade game about crafting food in a manic kitchen. You'll burn burgers, drop salads and mistime everything just as the order rush comes in. It's frantic fun at its best and you'll love playing this with your gaming pals as much as your never-gaming mother if you give it a chance. Great in 2D and even better in VR, Keep Talking and Nobody Explodes charges you with disarming a bomb just in time to stop yourself from exploding. The catch is you don't know how to do it and your friend is the only one with the instructions. Perfect with two players as much as it is with 10, you'll need great communication skills and fast talking to survive the harder disarmings. A somewhat stressful but always fun experience that's unique in gaming. 1 and only coop game to play, Period! Novalogic Delta Force Landwarrior is by far the best coop ever. Me and friends have searched and there is no other game like it or that can match the fun of that game. Are you a game company that wants to make a ton of money? Then go out and create a newer version of df3 and make LAN (no net play) actually work. Ok, meow meow for now.